Congratulations to Miss Jacqueline Purtell who was crowned Homecoming Queen on Friday (January 18) evening. Caption from left to right: Rennie Pearson, Sedonia Tringali, Jacqueline Purtell, O’Neil Goforth, Hannah Bonisa and Anna Crenshaw. 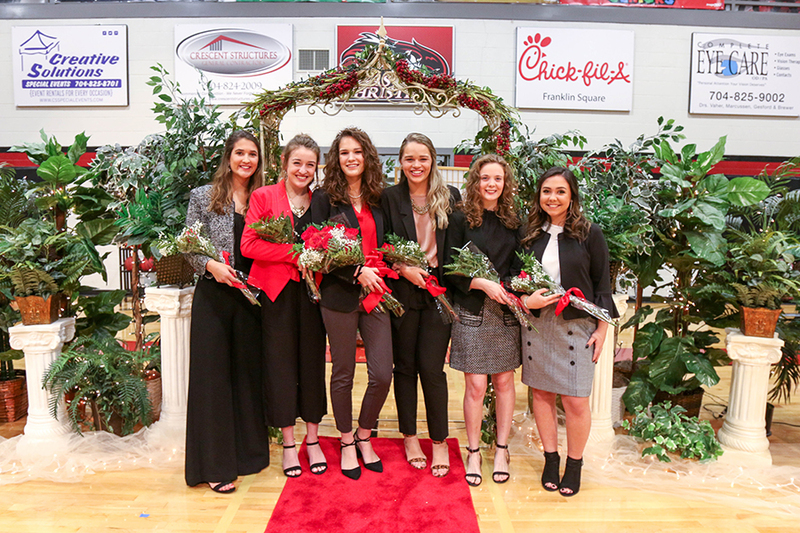 Six young ladies from Gaston Christian’s Class of 2019 comprised the Homecoming Court. Hannah, the daughter of Mike and Kathy Bonisa of Belmont, is a member of the Beta Club and has played on the Varsity Girls Volleyball and Varsity Girls Basketball teams. Hannah has recently signed to play basketball for Auburn University at Montgomery. Anna’s parents are Johnny and Lisa Crenshaw of Gastonia; a member of the Beta Club and the National Honor Society, Anna plays Varsity Softball and has recently signed to play for North Greenville University in Tigerville, SC. O’Neil, the daughter of Roy and Dona Goforth of Belmont, is a member of the Beta Club, National Honor Society, Interact Club, Student Government Association and serves as the president of the Spirit Club. O’Neil also plays on the Varsity Volleyball team. Rennie is the daughter of Joe and Tracee Pearson of Gastonia. Rennie serves as the President of the Student Government Association and is a member of Beta Club, National Honor Society and Interact Club. Rennie is also member of the Varsity Volleyball team. The daughter of Mark and Ingrid Purtell of Lake Wylie, Jacqueline is the Talon yearbook editor and serves as president of the International Club and as captain of the Mock Trial Team. Sedonia is the daughter of Tony and Heidi Tringali of Charlotte; she is a member of the Beta Club, National Honor Society, Interact Club and captain of the Varsity Volleyball team.